★★★★★ This is the most interactive 2 player game I have played on my switch. It’s very Kong yet, somehow, totally different. The graphics are FANTASTIC and at times make me really feel like I’m IN the game. I love that we can switch out characters, ride on each other’s backs (and other things like Rhino’s) surf over spikes and on and on with the hat full of Donkey Kong Favorites (like mine train carts and swimming). In 2 player Mode this game is the meaning of cooperation and makes you work together and take turns. For that reason it might frustrate little kids but if you’ll stick with it you could use it as a teaching tool for kindness and patience. A+ Nintendo. Really... A+. As a side note, I turned my brightness down, my black corrector on high and bumped the color to 75-80 percent. It made the graphics more glossy. ★★★★★ Pretty awesome if you liked the other DK games. The multiplayer can be challenging to coordinate but that adds some enjoyment as well. Def has replay value and will be fun to go find the secret areas after finishing the levels. 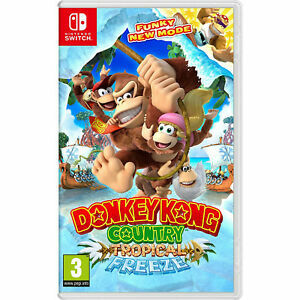 ★★★★★ I am a Dk fan and this game is truly a masterpiece. It is hard but extremely fun. Dk always have a great soundtrack and this game have one of them. Graphics are gorgeous. I recomend!! !